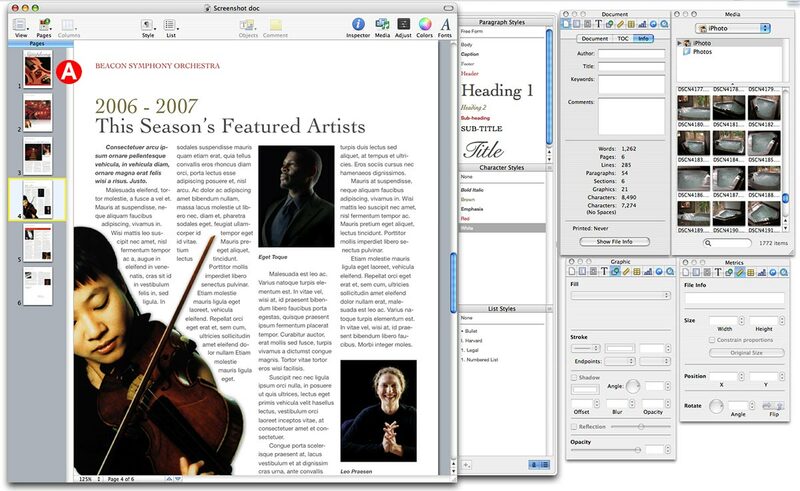 It’s been a year since Apple released Pages ( ; April 2005 ), the word processing and page-layout portion of the dynamic iWork duo—and what a difference a year makes. While I would like to have seen some of the application’s earlier weaknesses remedied sooner, I’m pleased that the new version of Pages is everything I hoped the initial release would be, and more. In Apple’s first release of Pages, several small details limited the application’s usefulness. The most significant was page management: it was impossible to rearrange or easily delete pages in a document. Not anymore: the program now includes a thumbnail browser, accessed from the toolbar. You can use it to move or delete pages, and it does double duty as a way to navigate quickly between all the pages in a document. Version 1’s image shortcomings are also a thing of the past. Documents containing images with drop shadows now retain those shadows when exported to PDF files and viewed in Adobe Acrobat. EPS (Encapsulated PostScript) files now import correctly into documents, and the Media Browser, which was originally limited to browsing iLife media, can now view other images on your hard drive. Unfortunately, selecting your personal folder of images is not as simple as pressing a button—you’ll need to drag your selected folder from the Finder to the Media Browser—but at least now you have this option. The only image problem I had was with Raw camera files in documents. While these images were viewable in Preview, they appeared pixelated both in Pages and when we printed the documents (Apple is looking into this bug). Flexible Page Handling Pages’ new Thumbnail drawer (A) allows you to select, rearrange, or delete pages with ease. Pages also includes a new Mail Merge function that allows you to merge data from Apple’s Address Book app into Pages documents. Pages makes ample use of this feature in several of the 66 document templates that ship with the program. For example, open the new Expense Report template, and you’ll see that Pages has already filled in your personal information, from the card you’ve marked as “me” in Address Book. The Mail Merge function’s connection to Address Book does have some limitations though, especially if the names you use for mass mailings aren’t the same names you want to keep in your personal address book. You should also closely check any template you use, to ensure that personal information isn’t included somewhere you weren’t expecting to see it. Fixing what ailed the first version of Pages would have been enough to make me happy, but Apple has also added several new features. Pages now lets you select images or text and then add comments to them. These comments transferred nicely when I exported my documents to Word, but comment IDs and date information were missing when I created comments in Word and tried to view them in Pages. Apple expects to fix this bug soon. Pages also includes a new Auto-Correction tool, which corrects commonly misspelled words as you type, and a new Search bar that, as with Preview, displays every instance of your search word or phrase in a sidebar. Selecting one of these instances brings you to the page in your document where the word or phrase appears, with the text automatically selected on the page. You can also use the Auto-Correction tool to create your own shortcuts for commonly used long phrases. For instance, you can type something like *syo* in your document and have Pages replace it with *Sincerely yours,* . On the graphics front, Pages now includes a new reflection option for images, which makes it appear as if your images are resting on a highly reflective surface. This looks especially nice on dark backgrounds. The program also includes an Image Adjustment panel, similar to the one in iPhoto, that lets you change image settings such as brightness, contrast, and saturation. Graphs in Pages can now be displayed in three dimensions, but the tool for manipulating these 3-D graphs is cumbersome—which seems odd given how easy it is to manipulate other graphics in a document. Pages’ new Table tool allows you to perform minor calculations. The program supports six basic functions: Sum, Average, Min, Max, Count, and Product, which will take the numeric information you enter and automatically calculate the totals. This is a welcome new feature, but unfortunately Pages is still missing a fully functioning spreadsheet tool for performing more-complicated calculations. Pages 2 is a significant improvement on the previous version. It provides excellent word processing features in a package that can also act as a top-notch desktop publishing application. While Pages lacks a full-featured spreadsheet application, it is a versatile and powerful program that will fill a multitude of educational, personal, and professional needs without making you wish that you had something more.